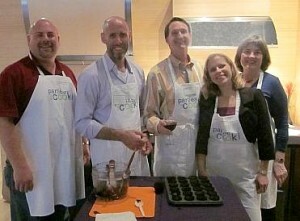 One week ago today, Parties That Cook was powering through the last corporate team building events of a crazy week. With 11 events in just 3 days, we were running like a well-oiled machine! Hosting groups included the Council of Business Advisors, PRTM and RTI, checking in with as many as 86 guests! RTI hosted a lunch-time Kitchen Challenge event, with all 86 guests participating in this heated cooking competition! Our team of professional chefs, lead by seasoned Executive Chef Tanya, was all over it – remaining calm and collected through the madness. 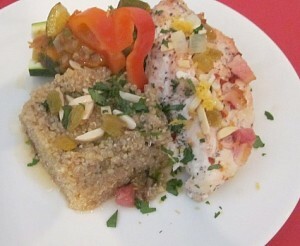 Guests broke into teams, creating a variety of delicious, well-presented dishes. There was even a tie for Best Protein, which was later decided by crowd applause. 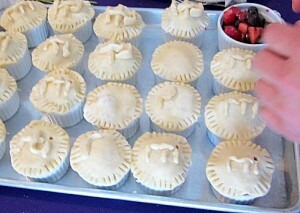 The dessert team went above and beyond, adding the letters RTI to the Seasonal Fruit Potpies! (A+, guys!) According to Samantha, the RTI host, “As a planner, the best part was that Chef Tanya and the staff really took over and completely handled our group when it was time to begin. I’m not used to that, and it made it so I could really enjoy myself and participate as well. From a participant perspective, the best part was being able to see another side of the people I work with. I learned something new about everyone! It was definitely a bonding experience.” After talking to a few male guests, she later reported that even the skeptics of the group admitted they loved it! The Council of Business Advisors opted for a Sumptuous Small Plates event – a great choice for their goal of getting to know each other better! The crave-inducing menu included client favorites such as Ahi Tuna Tartar in Toasted Won Ton Cups, Mini Gyros (Pita pockets filled with Grilled Lamb), Shiitake-Scallion Pot Stickers and Savory Plum & Thyme Bruschetta (featured in yesterday’s blog post!). They ended the evening on a sweet note, serving Double Chocolate Hazelnut Mousse Tartlets. Yum! Throughout the event, guests were mingling with fellow organization members and meeting members they had never met before. Guest s loved Chef Mick! Joe, our point of contact for the event, stated, “Everyone had a great time… Chef Mick was great… Plenty of great conversation and fun, and the energy was high from beginning to end.” We love to hear that! 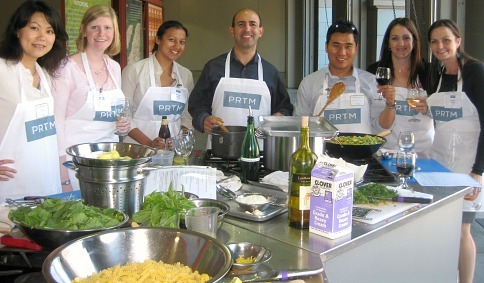 To round things out, PRTM chose a Chef’s Table event for their summer associates. Sitting down to enjoy 4 courses prepared by your co-workers/fellow event guests is a great way to build camaraderie! 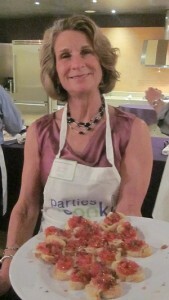 According to Chef Scott, the group, which included a number of foodies, really enjoyed the food. A menu including Savory Plum & Thyme Bruschetta, Flash Fried Cornmeal Calamari, Balsamic-Marinated Grilled Skirt Steak and Warm Chocolate Budino with Raspberry Sauce sounds good to me! 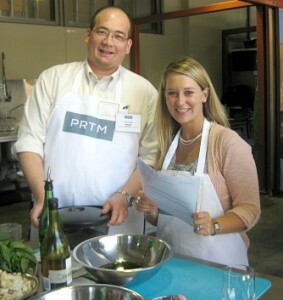 PRTM’s Recruiting Program Manager (and event host), Kerri, thought “the team collaboration, venue, the tips from the chef, recipes and wine pairing –every part of the event was GREAT! !” The perfect ending PTC’s action-packed week! Until Monday, when start another run of 11 events. Hope to see you in the kitchen (or out on a farm) soon!